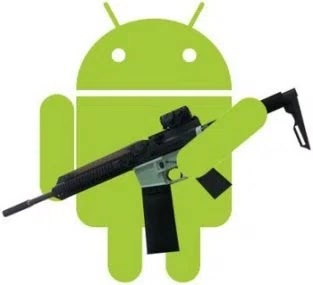 Greetings to all android game lovers and droidapkgames.net fans out there. This is my first tutorial ever since i started to blog i want ti also use this medium to inform you guys that my birthday is on 15th of this month (September) 😛 . In this tutorial am going to show you guys how to install an android games with obb data file (cache), this is not a new something for some guys out there but i still have to write the tutorial for the newbies out there. 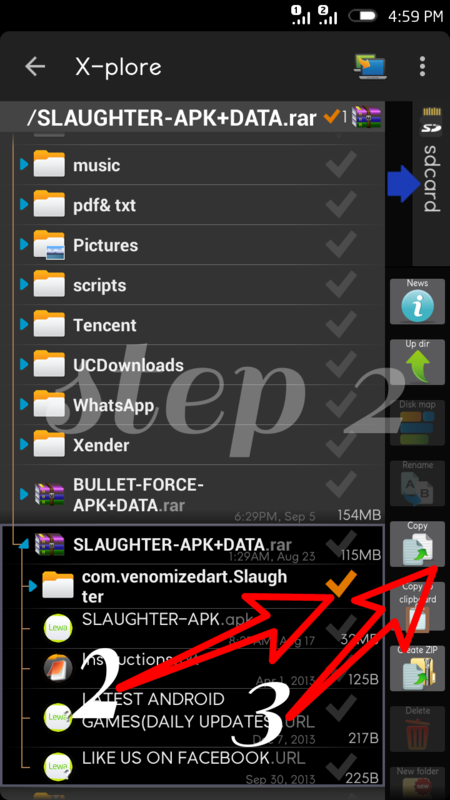 In this tutorial we are going to make a use of an android file manager app know as file x-plore (this my best file manager app right form the days of s60v2 and s60v3 mobile phones) you can download it from HERE and android game known as SLAUGHTER (A Supercool android third person shooter game with stunning graphics, breathtaking gameplay, and easy control layout accompanied with a nice soundtrack that will makes the game ultra coo). 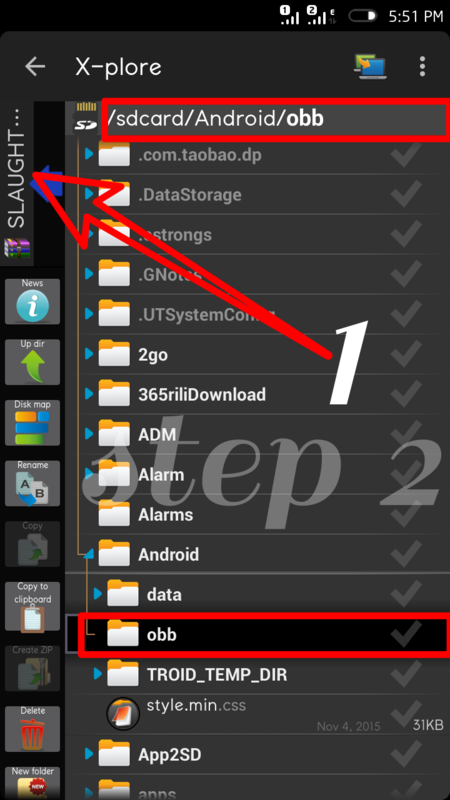 *NOTE: You can use these steps to install any android game with obb data file. I.e it’s not only for slaughter. Now let’s hit the nail on the head. After downloading the x-plore file manager install and open. 1. Locate the game in .zip/.rar format and click on it. 2. Click on the red/blue (will be red if you are using the free version and blue if you are using the pro version) arrow at the top left/right (depend on the current pane you are in) to switch to the other screen/pane where you will locate the obb data folder (obb data folder is located at SDcard/Android/Obb) if you didn’t find the folder in your there don’t panic thinking you won’t be able to play games with data files (cause i actually felt the same way the day i wanted to play a game with obb data file) just long press the Android folder a pop will display with list of actions, just click new folder and name the folder obb. Once you are done, proceed with step 2 below. 3. Look right click copy or Long click the obb data folder, a pop with list of actions will be displayed click on COPY and wait for few mins for your work to be done. 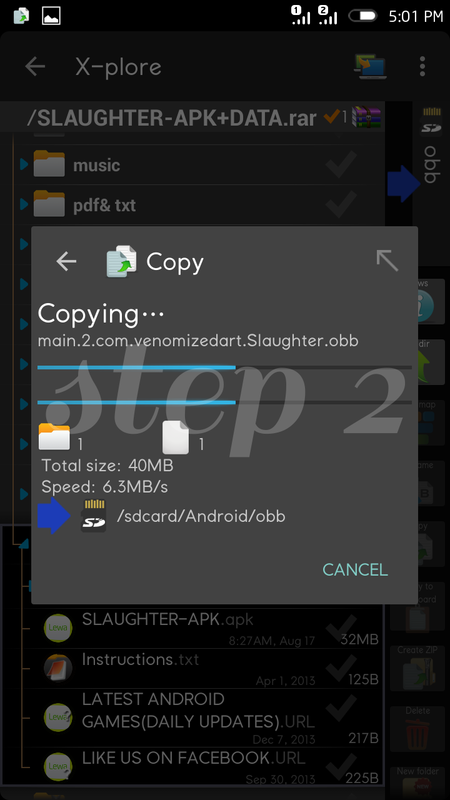 Once you’re done copying the obb data folder to obb proceed to step 3. 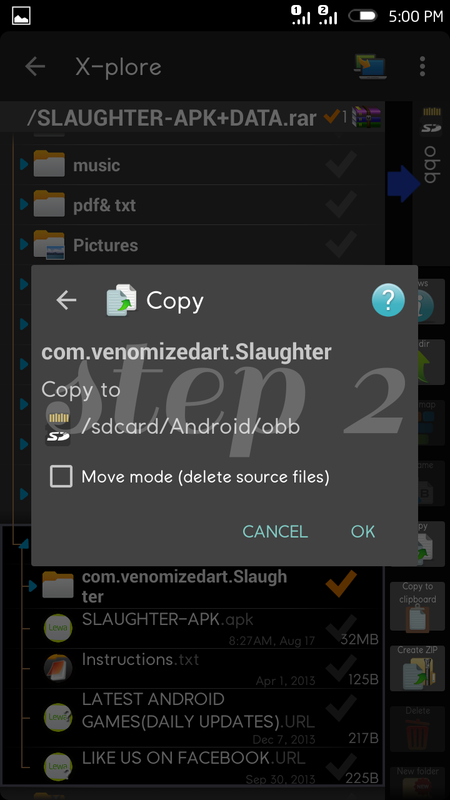 1. click the .apk file to install the game close the file x-plore (if you like you can delete the .zip/.rar file you downloaded or leave it the choice is yours). 2. Open the installed game and enjoy. Hope this works for you? 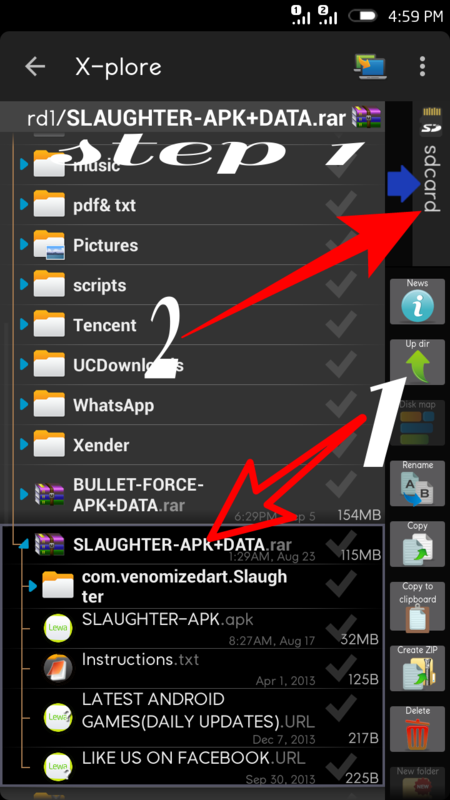 As i said earlier this tutorial is the general way to install android games with obb data files it’s not only meant for Slaughter game as i used in the screenshots. Do you encounter any error or you have questions to ask? Kindly make use of our comment box below.